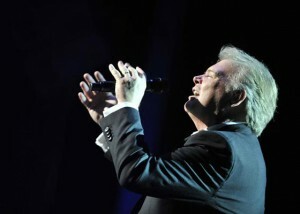 The Australian public assumed that John Farnham was serious when he announced he was saying goodbye to the live performance circuit with his 2002 ‘The Last Time’ concert tour. Obviously he wasn’t – ’cause he’s been out on the road quite a bit since. He paired with Tom Jones for a series of dates in 2004, performed shows at the Opera House and the Victorian Arts Centre two years later, performed with Stevie Nicks on a double header tour and has been on the road on and off since his star turn with Coldplay for the Sydney Sound Relief concert in 2009. So it’s with no great surprise that Farnsey has today once again announced he’s heading on tour – this time to celebrate the 25th Anniversary of the release of his iconic album ‘Whispering Jack’. The first half of the show will see John performing some of his biggest hits unplugged and acoustic, while the second half will see the full band perform the entire ‘Whispering Jack’ album, containing some of the singer’s biggest hits; ‘Pressure Down’, ‘A Touch Of Paradise’ and the inimitable ‘You’re The Voice’. The tour kicks off in Adelaide on Wednesday October 05 before making stops in Sydney, Brisbane, Melbourne and Perth. Tickets for all dates are on sale on Tuesday June 21.